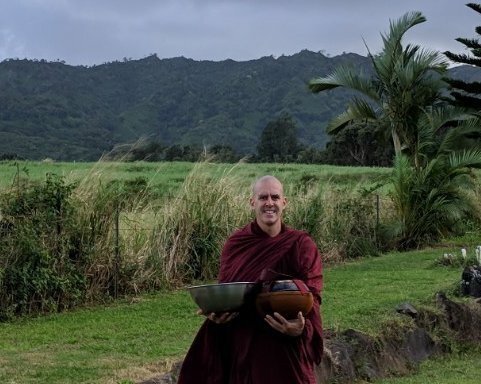 On a warm Hawaiian Christmas day in 2018, I was off to collect my alms in the village. I was in a rush and worried that I would not be able to find a ride to the village where I go for alms because so few cars would be on the roads. Luckily, I got a ride and as I stepped out of the the car, I did my usual baggage check. Bowl? OMG! How did that happen? Yes, I forgot my bowl on my way to go for alms because I was running late and rushing. It happens in monasteries, but one can recover within a few minutes. However when you are already in another village and you realized you forgot your bowl, you need to make a decision. Go back and get your bowl and be late, abort the alms altogether, or improvise. I was in the process of aborting, but two thoughts occurred to me. 1. I usually do alms as a practice of loving-kindness, so why worry about collecting food? 2. My friend who lives in the village might have a stainless steel mixing bowl. What if I were to borrow his mixing bowl? I decided to explore both of those options and stopped by my friend’s house and asked him if he had a mixing bowl which he did have. 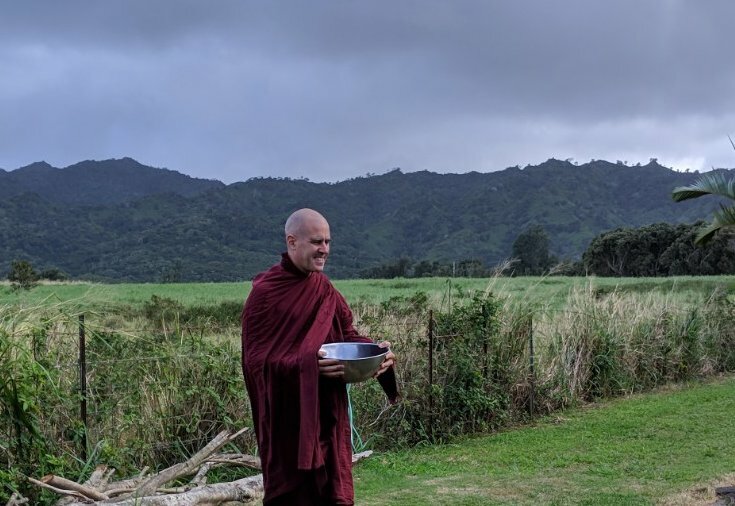 I decided I would use his stainless steel mixing bowl (which is an allowable alms bowl material) and go for alms while practicing my usual loving-kindness in front of each house. While it was Christmas, the mixing bowl worked quite well. I received food from two new people. Two of my regular donors noticed that my bowl was different, but the rest never noticed. Was it the special day or was it the bowl? Probably both, although I have never duplicated going for alms with a mixing bowl again. In the West, I have encountered many questions about my alms bowl. 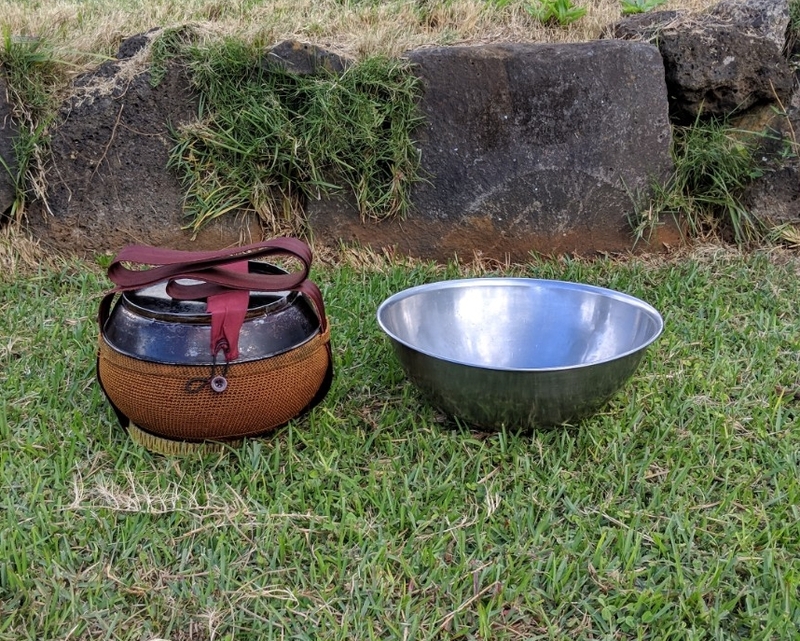 A common comment is, “Hey, nice drum.” In reality, the monk’s bowl is a special shape, with nice little covers and with nice little straps complete with a little stand on the bottom. After all that, the bowl doesn’t really look like a bowl anymore to the average person in the West. I think if I did a survey and asked people what they thought my alms bowl was, I think 30% would say a bowl, 30% would say a drum, and 40% would not really know for sure. If my goal is to gather food, it might be good to use something that is obvious for collecting food. I would guess that panhandling was when people would carry a frying pan around to collect food. After some time, it was used for money to buy food, and then of course it just became a name for aggressive beggars who want money. What if real panhandling were to carry around a device (a bowl or frying pan) that would signify someone was collecting food to eat? It seems like it makes sense, but the websites that “have researched this” consider this reason to be very weak. Why? As begging shifted towards a way to make money, the idea of someone collecting “food” has been lost. Since monks do not cook, a mixing bowl rather than a frying pan seems to be a very vivid image of a monk who has a purpose to collect food. In fact, it provides such an obvious begging imagery, that I am somewhat embarrassed to use a mixing bowl again. Imagine that! After all I have done on my alms rounds to help the Westerners know that I am collecting food, I just cannot get myself to do the most obvious and carry a mixing bowl. That is because it is too obvious and I still like to be passive in my collection of alms. However, if there was an emergency however, I would not be afraid to use one again. Even though I am embarrassed to do it again, the mixing bowl would probably be more effective and the thought has crossed my mind again and again to the point where I am writing this article. What are your thoughts? Leave a comment and mention whether or not you are or were a monk. Where are you dwelling now? I wonder which method are you practising now? I am in Hawaii and I use the traditional monk’s alms bowl. I have only used a mixing bowl once as written in the article. Thank you for the story, Bhante. I’m not very familiar with the Vinaya or the history of the Vinaya. Monks’ bowls seem very specialized now. 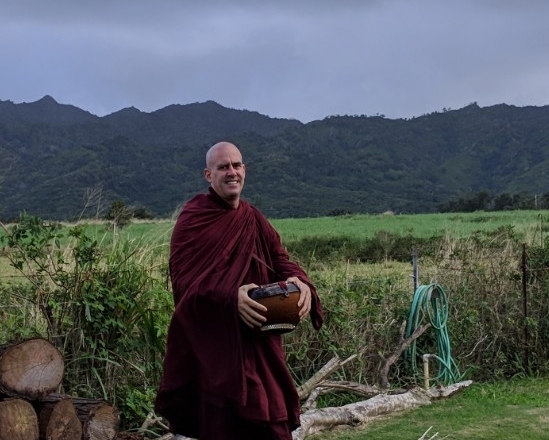 I’m sure they’re instantly recognizable in the primary Theravada nations, just as recognizable as a mixing bowl to Westerners. Were monks’ bowls as specialized at the time of the Buddha? Would monks’ bowls of that time have just been recognized as a normal bowl associated with food? If allowable, I’d say take the covering off of your bowl during Pindipata, but the protective firing of it (dark color), probably contributes as well towards making it less recognozable as a bowl for food. The monks in the time of the Buddha did not use bowl lids. That is a good suggestion. The color is to protect it. It is required to have the bowl fired with sesame seed oil 5 times for iron bowls. Stainless steel bowls are treated as iron. The Thai tradition usually ignores this for stainless because it is less prone to rusting but not immune. Bhante, sorry if I was not clear. When I was referring to the cover, I meant the knit outer covering connected to the straps. I think that knit covering contributes to the misperceptions of it as a drum. But you’re probably right, that the lid also affects its perception. Thank you for the reminder about the sesame seed oil firing. Sorry, I forgot to mention, I’m not a monk or former monk. Myanmar tradition does not use the bowl bag. However I use the bowl bag when I use my umbrella. Sometimes I need the bowl bag anyways because it rains and then stops and rains and stops. Yes, it is a good idea not to use the cloth cover/bag/bowl holder.